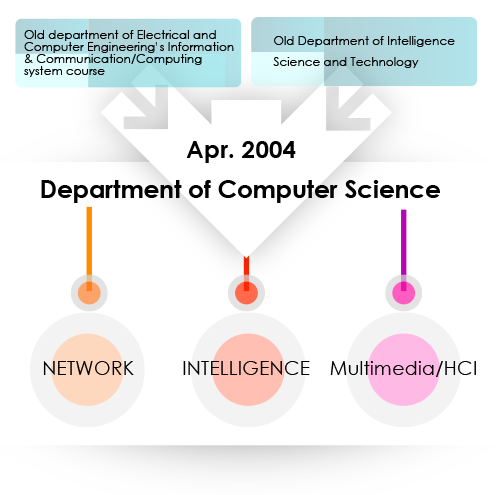 In April 2004, the new Department of Computer Science was formed, after merging the two departments, part of which used to be the old department of Electrical and Computer Engineering’s Information & Communication/Computing system course and the old Department of Intelligence Science and Technology. Current student admission is 145 (we admitted 154 students in 2018). This program is intended to foster human resources that will be capable of building not only network of existing mobile phones and the Internet but also a new information network system that is expected to be developed in the future or performing research and developing thereof. Networks initially developed were that the main frame and a dedicated terminal connected with cable from the manufacture, and different manufactures developed network technologies having different standards, causing problems with mutual connections. Currently, the Internet (TCP / IP) is the technology that has become widely used. For this reason, students will learn primarily about hardware, software as well as information network understanding from theory to practice so as to acquire knowledge, creativity and technical capability to build and develop the next generation of information network system. This program is intended to foster creative human resources capable of performing research and development of a system to achieve a high degree of intelligence processing, such as knowledge processing, reasoning and learning which can be a foundation for the next generation of information processing society. Information processing means processing of original “information” to obtain information in different forms through calculation, processing and extraction, etc. Students will learn basic theory of representation, inference and learning of knowledge required for intelligence processing, as well as theory and practice of intelligence robots, sensitivity information, neural information, agent, natural language processing, code-encryption systematically through programming, with mathematical as its foundation. Students will develop deep understanding and creativity on image and audio information processing, sensibility-biological information processing, as well as media security, and learn the theory and practice methods of building the next-generation media information system by incorporating projects and exercises.